Is Your Business Using Foursqure? With the influx of social media and their overlapping functionality, many business owners are finding it difficult to decide where to participate and what conversations to join. Twitter and Facebook are becoming commonplace but there is another contender in the social media space which can be profitable for your business–it’s called Foursquare. It may be better to discuss real world examples to see how some busineses are using Foursqaure right now. By the way, this doesn’t mean there aren’t other ways out there. In my personal use of foursquare, I have seen several businesses using the application successfully to drive customers to their business. Ex. 1 Wine & Beer Westpark, located in the West End of Richmond, VA is my first example. This area of Richmond is known for it’s big box stores, chain restaurants and strip malls. The owner of this wine shop, Matt, decided to host a party and encouraged people on foursquare to check in in order to earn the much coveted swarm badge. A swarm badge is earned when a certain number of people check into the same location at the same time. He announced this party on Twitter and on his blog, and had a huge turn out to his store. Everyone who attended did earn the swarm badge and Matt earned some new customers as well as some publicity in a local paper (clicking the image will take you to a browse-able copy of that issue or you can go to Grid’s website). Ex. 2 Starbucks got in the game early with it’s Nationwide Mayor Special. 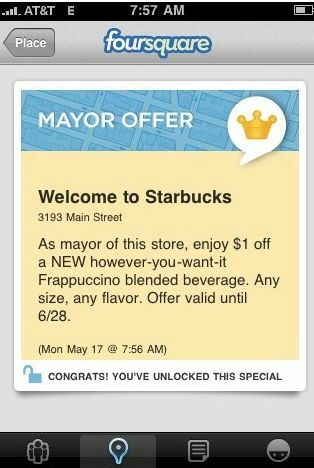 It’s simple, Starbucks extends local store mayor specials to all it’s stores with a single $1 frappuchino coupon for any Starbucks mayor at any Starbucks. I joined Foursquare within a week of it coming out. I checked in like I was supposed to, and I waited. I waited, and I waited. There wasn’t a lot happening. I could see other people checking in and I became the mayor of a few locations. I earned a few badges. But I still thought I was missing the point. So what if I was the mayor. So what if I had the gym rat badge. Then one day, I checked it at work and a little note popped up. It was an offer from the Starbucks down the street stating that the mayor of that Starbucks was entitled to a free frappacinno . Wow, suddenly being a mayor was paying off. Guess who was the major? This guy. Since then I’ve noticed similar offers being made all over town by savvy business owners that understand that people checking in to their location means customers! woo-hoo! With all of this said, Foursquare isn’t perfect. There are server issues which can cause the app to crash, meaning you can’t check in. And some people cheat the system by just driving by places and checking in so that they can have majorships without “earning” them. A lot of companies still aren’t using foursquare to attract customers (many are unaware that it even exists) so sometimes users can just feel that they are checking in for no reason. A healthly competition for mayorships helps to ward off this feeling, but if more businesses engage, more users will join and existing users will become more active. There are other issues on the business side that have some business owners frustrated. I’ve heard tale of trouble getting foursquare to respond to business owner demands, and I’ve heard, anecdotally, that it is very difficult to have a badge created that you can use for your business in order to attract users in. I have no first hand experience with these issues myself. My advice, if you own a brick and mortar business, get on foursquare asap. I’d be willing to bet a user has already added your company, and people are probably checking in every day without you even knowing. Soon I’ll be discussing ideas on how to use Foursquare to bring in new business.